The Saudis are widely believed to have<a href="https://www.washingtonpost.com/world/national-security/crown-prince-sought-to-lure-khashoggi-back-to-saudi-arabia-and-detain-him-us-intercepts-show/2018/10/10/57bd7948-cc9a-11e8-920f-dd52e1ae4570_story.html"> murdered Washington Post journalist Jamal Khashoggi in the Saudi Consulate </a>in Istanbul, Turkey. The Washington Post’s columns are a place where Khashoggi contributed, and they've now cited US officials as claiming that several Saudi totals were recorded discussing a plan to lure and capture Khashoggi. The criticisms being thrown at Crown Prince Mohammed bin Salman have remained strong from both the White House and international counterparts amidst the ongoing investigation process. For years we've known about the Central Intelligence Agency (CIA) having involvement in the Washington Post. President Trump has vocally opposed the Jeff Bezos “Amazon Washington Post” for years, even prior to his Presidency. As President, Donald Trump has to place the life of an American over his battle with the Amazon owner's Washington Post, despite Bezos being wholeheartedly in opposition to Trump. This is where Donald Trump usually shines, in separating his old victories against conflicting interests when making the right decision. Thus far, the President has dodged any major assault from the Democrats over his Saudi support as President. Sometimes the best consequence for America isn't always the best for one's reputation, and Trump deserves criticism for his dealings with the Saudis, albeit he has been tough on them prior and since. The looming cloud of Khashoggi has remained a dire consequence of the Crown Prince Mohammed bin Salman’s attempts at a brutal takeover of the Saudi Kingdom. We've seen the leadership of Saudi Arabia shuffle under the presumptive next-in-line to be King, Crown Prince Mohammed bin Salman. If Khashoggi's death was in fact ordered by the Crown Prince, there will likely be a furious and raging economic battle between America and the Crown Prince of Saudi Arabia, who has previously used China as a bargaining chip. China, who itself has sought to subvert American economic prosperity in recent years, would love nothing more than to break Trump's will. In giving the Saudis an enormous weapons deal, President Trump made a huge mistake. America and China are already engaged in a brutal trade war of which President Trump has seemingly outplayed the Chinese at every angle. That said, a Saudi-Chinese brokering of peace and economic dealings could destroy all that the Trump Administration has countered China with thus far. In the last two years, Princes of Saudi Arabia, both powerful and weakened, have been brought down on corruption charges, in what appears to be a coup d'état effort of securing bin Salman’s ascension to the throne. As a result, shares of Saudi Arabia’s stock have plummeted in anticipation of any sanctions. The main stock market in Riyadh would fall as much as 7%, according to<a href="https://www.cnbc.com/2018/10/14/saudi-stocks-plunge-on-khashoggi-fallout-biggest-drop--since-2014.html"> CNBC</a>, costing billions of losses across the board. The Crown Prince is now put in the grips of a tough position. He can either take the sanctions against the Kingdom and be crucified at home or, oppose the sanctions firmly and make deals with China. The Kingdom of Saudi Arabia has always held extreme influence over the United States of America's government, and they're now threatening their own retaliatory actions to any sanctions posed by the United States of America. The 60 Minutes episode that was aired discussed the potential punishments against the Kingdom of Saudi Arabia, but President Trump has oftentimes made his own dealings with Saudi royals. A weapons deal made in Trump's first test has countless millions of American jobs riding on the good relations of US-Saudi investments. Part of the Trump Administration’s efforts will be to ensure that these trade deals are protected, all whilst promoting justice for Khashoggi's family. 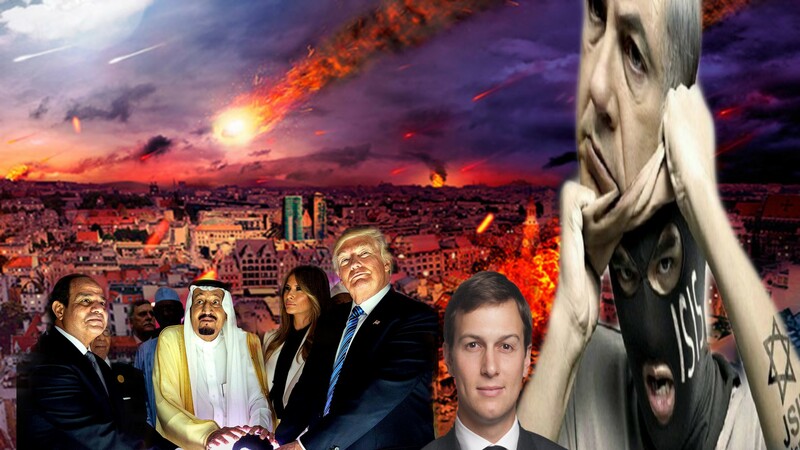 Most Americans simply don't realize that the President made a mistake when dealing with the<a href="https://defence.pk/pdf/threads/zionist-rulers-of-saudi-arabia.19023/"> crypto-Zionist leadership of Saudi Arabia </a>in the first place. The House of Saud, and it's<a href="http://themillenniumreport.com/2015/12/is-the-saudi-royal-family-jewish/"> fabled Jewish origin</a>, each represents the same Rothschild family interests of that of Greater Israel. Some claim that Trump is being manipulated into allowing the Biblical War that Israel wants. Israeli-Iranian conflict in Syria is seen by the Arab press as the beginning of the first war between Israelis and Persians. Many Arab commentators avoid condemning Israel, say the Islamic Republic is on the brink of economic collapse. Anwar Eshki, a retired intelligence officer in the Saudi army and head of the Middle East Center for Strategic and Legal Studies, irritated many in the Arab world recently when he said that Israel was a suspected enemy while Iran was a definite enemy. “He explained that Israel hadn’t fired a single bullet at Saudi Arabia, while Iran kept firing missiles at the kingdom and even at the holy city of Mecca through the Shiite Houthi rebels in Yemen. He didn’t rule out a collaboration with Israel, as long as it joined the Saudi peace initiative,”<a href="https://www.ynetnews.com/articles/0,7340,L-5263184,00.html"> YNet </a>wrote. The Israeli influence is obvious. That's the Middle East, in a nutshell. Neo-Conservative influences from the likes of John Bolton all but ensure an Israeli war with Syria and Iran, bringing Saudi Arabia, Russia, and Turkey into the battlefield. “In Syria, Kurdish forces fighting ISIS are linked to the Marxist PKK in Turkey. They pose a real threat to Turkey’s territorial integrity,” Bolton added. It's Biblical, as all three Abrahamic religions say. Bolton wants the United States to declare the Muslim Brotherhood a terrorist organization and supports Trump’s backing of the Saudi Arabian and United Arab Emirates embargo against Qatar as punishment for its ties to both the Brotherhood and Iran. John Bolton also wants to be added to the US terrorist list Iran’s Revolutionary Guard Corps (IRGC). National Security Adviser John Bolton is on record as favoring the creation of a new “secular” Sunni state in Iraq that would be bankrolled by Saudi Arabia. The new Sunni state, in Bolton’s view, would stymie the creation of a Shi’a arc of control extending from Iran through Iraq to Syria and Lebanon. Saudi Arabia has simply awaited action in the Greater Israel project. This is, in part, because Crown Prince bin Salman has warned against the also powerful Prince bin Talal, who has a stranglehold on American tech, for supremacy towards the ascension to the throne. Saudi Prince bin Salman has attempted to remain to have strong relations with President Trump despite his brutal history. We shall see how this unfolds.